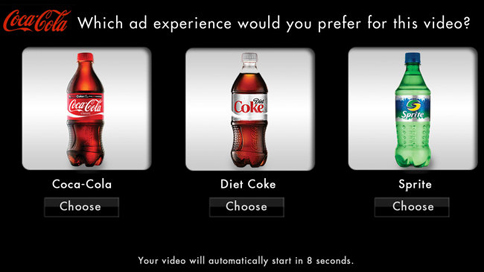 Is There a Future for Choose-Your-Own-Ad Ventures? The New York Times had an interesting read this weekend on experiments by Hulu and YouTube to let viewers pick which ads they're forced to endure. In some cases, this means selecting a spot from a list of brands, but it also includes letting viewers choose whether to watch several short ads or one long one. In pretty much every case, it sounds like the results are underwhelming. Hulu's new "Ad Swap" button, which lets you switch to an ad that's more pertinent to you, is nice in theory, but as the Times notes, "The system isn’t perfect. By the time users decide to go with an alternative, they may have already seen a good portion of the first ad. Beginning a second one means a longer commercial break." Another Hulu approach is to let you pick a 150-second ad in place of several shorter ones, but the site admits this too has not proven to be a popular process. YouTube is also testing an ad unit that lets you choose from three commercials when watching a long-form clip, but relatively few brands have signed up. More popular (for obvious reasons) is the site's "Skip This Ad" option, which lets viewers bypass boring spots and leaves brands feeling confident that the ads they pay for are being watched by willing participants instead of being cursed at by a captive audience.